The first phase of the period included the introduction of not only a legal framework that tipped the playing field toward Sisi by establishing a truncated timeline and high barriers to entry, but also repressive and violent efforts to neutralize opponents by whatever means necessary. 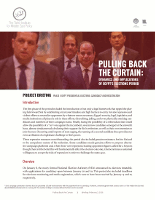 Egypt’s security, legal, legislative, and media institutions all played a role in these efforts, discrediting, jailing, and even physically attacking candidates and members of their campaign teams. Finally, facing the possibility of a referendum that would allow the possibility of a “no” vote against the incumbent, several new candidates emerged at the eleventh hour, almost simultaneously declaring their support for Sisi’s reelection as well as their own intention to join the race. Occurring amid reports of state urging, the naming of a second candidate thus provides not even an illusion of a legitimate challenge to Sisi’s power. These repressive measures notwithstanding, the period also included genuine resistance, both to Sisi and to the compulsory nature of his reelection. Some candidates made genuine efforts to propose alternative campaign platforms and, when these were repressed, leading opposition figures called for a boycott; though there is little belief this will fundamentally affect the election outcome, it demonstrates a sustained willingness to accept the risks of repression in order to challenge the status quo. Candidates were required to procure at least 25,000 endorsements from citizens in at least 15 governorates—or at least 20 endorsements from members of the House of Representatives to be eligible to contest the election. (For more details on the Laws and Procedures governing the election, including a timeline, see our Factsheet.) Sitting President Abdel-Fattah El Sisi garnered support from at least 549 parliamentarians, and well over the necessary 25,000 endorsements from the public. In a last-minute announcement, and amid reports of government urging, Ghad Party leader Moussa Mustafa Moussa submitted the paperwork for his candidacy; Moussa received the support of 26 parliamentarians and a reported 43,000 individuals in a matter of hours. Sisi announced on January 19 that he would run for reelection, though at least three national campaigns were supporting his candidacy in the four months prior to his announcement. The To Build It, Participate…A Better Tomorrow, and A Citizen Who Supports the President campaigns held rallies locally and internationally to drum up support for Sisi’s reelection. They claim to have collected over 4.5 million signatures in support of his reelection. Multiple members of parliament and party leaders from outside parliament hosted or attended the pro-Sisi rallies held under the aegis of these campaigns. By the conclusion of the endorsement period, Sisi had secured the endorsements of as many as 549 of the 595 members of the House of Representatives, though only 20 formal endorsements were required to qualify his candidacy. Serious efforts to push challengers out of the race had been ongoing for almost a year ahead of the registration period. In addition to criticism from media, former candidate Ahmed Shafiq was detained in a Cairo hotel for a month until he made the decision to withdraw. Former parliamentarian Muhammad Anwar al-Sadat, head of the Reform and Development Party, backtracked on his interest in running after complaining of harassment. Human rights lawyer Khaled Ali had been alternatively publicly skewered over his candidacy, denied media access to promote his campaign, in face of a court case that would have barred him from running, and subjected to the seizure and destruction of his materials by state security forces, until he withdrew from the race, citing “a campaign of pressure.” Former armed forces chief of staff Sami Anan, a contender with backing from political elite, was arrested by military prosecution and sent to a military prison just days after his announcement, forcing his withdrawal. The elections laws and timeline posed significant challenges for most candidates seeking to challenge Sisi’s incumbency. Given the nearly unanimous support for Sisi in parliament (only the opposition 25-30 Bloc announced that it would not officially endorse a candidate), candidates were faced with the challenge of securing 25,000 endorsements in less than a month. Reports from Anan and Ali’s campaigns alleged that their endorsements were not accepted in some cases. Even aside from the political pressure to withdraw, this put opposition candidates at a severe disadvantage compared to the incumbent, who enjoyed four years to effectively campaign, present a political platform, and employ the media apparatus to his credit. The NEA announcedthat 1.35 million endorsements had been received from citizens supporting at least 28 candidates, including Sisi, Shafiq, Ali, Sadat, and Anan, as well as 2014 presidential candidate Hamdeen Sabahi, Representative Mortada Mansour, university professor Mona Prince, former president Hosni Mubarak, his son Gamal Mubarak, and others. However, only Sisi, Badawi, and Moussa were reported to have earned enough public endorsements to run, despite the latter two having announced their intent only in week prior to elections. Given the interference in the candidate list and the restrictive landscape, leading opposition figures issued a statement demanding that the NEA halt the presidential election process, accusing it of interfering in and marring the election. The statement was signed by 48 individuals, including Sadat; Hazem Hosni, university professor and adviser to Anan’s campaign; and Hisham Geneina, former head of the Central Auditing Organization and adviser to Anan’s campaign. (Additionally, Sadat called for a march to the presidential palace to demand a meeting with Sisi, though no date was set.) In response to the statement, lawyer Samir Sabry filed a complaint, accusing signatories of incitement against the state and seeking external interference in Egyptian affairs. Egypt’s media landscape has been consolidated behind the country’s security apparatus, loyal to Sisi, over the past years, and media attacked potential challengers throughout this phase. Regime-aligned media such as al-Youm al-Sabaa and its parliamentary news site, Parlmany, ranarticles highlighting how popular the To Build It Campaign is, though others, including al-Bawaba, questioned the campaign’s actual popularity in light of Sisi’s failures as president. Television media took an active role in discrediting potential challengers, with talk-show hosts disparaging potential challengers. The ability of monitors to oversee the election was guaranteed in an NEA decree, but some of its language is vague, leaving discretion in the hands of the commission’s members. The time period to request authorization to monitor the elections was open from January 9 to January 15, and extended until February 1. By January 28, the NEA announced that it would allow 4 international and 44 local organizations to monitor the election. But, the wording of the regulation left uncertainty about selection: For example, it is unclear what it means for a nongovernmental organization to be impartial and whether, for example, the commission would determine a human rights organization that documents violations committed by government officials to be sufficiently impartial. Additionally, though some reports suggested the body was still reviewing the applications of at least 24 additional organizations, the number of monitors accepted still falls well below the 85 that were approved to monitor the 2014 presidential election. Egyptian parliamentarians denounced foreign organizations’ participation in the monitoring process, though they had no authority over applications for monitors. Foreign media bodies wishing to cover the elections were required to request permission to cover the election. Requests were to have been submitted to the State Information Services by January 22 and passed on to the NEA by January 24. It is still unclear which outlets have done so and which, if any, have been authorized. A final list of approved media outlets should be made available on March 5. Over this period, many in the international community raised concerns over repressive actions in this phase. In a statement commemorating the anniversary of the January 25 uprisings, United States Senator John McCain urged the current government to “fulfill [its] commitment to genuine political reform and respect for human rights.” (For his part, however, Secretary of State Rex Tillerson made no mention of the elections in a phone call to his Egyptian counterpart, Sameh Shoukry, on January 25.) Human Rights Watch, Amnesty International, the Committee to Protect Journalists, and others have decried rights abuses in the lead-up to the election Sisi’s campaign spokesman claimed that Sisi presented 173,000 endorsements with the paperwork for his candidacy. However, unnamed government sources have told the media that Sisi had about 900,000 endorsements on January 24. This number is likely to increase before the final count is revealed. Sisi’s campaign spokesman claimed that Sisi presented 173,000 endorsements with the paperwork for his candidacy. However, unnamed government sources have told the media that Sisi had about 900,000 endorsements on January 24. This number is likely to increase before the final count is revealed. Even after having withdrawn from the race, Anan’s team continued to face harassment. Hisham Geneina, one of Anan’s running mates and the former head of the Central Auditing Organization, was attacked outside his home. The full list also included Muhammad Salah Abdul Muati, Ahmed Abdul Ghani Abdul Latif, Walid Fawzi al-Garhi al-Behnesawi, Muhammad Omar Fatouh al-Mughazi, Ahmed Muhammad Kamel Hassan Shahin, Ahmed Mukhtar Metwali Sharif al-Din, Muhammad Abdul Karim Muhammad Zahran, Tariq Said Mustafa Soleiman, Taher Muhammad Fathi Abduh Mustafa, Maged Muhammad Muhammad Kashek, Muhammad Muhammad Ramadan Eid, Atef Labib Gad al-Karim, Muhammad Abdul Moneim al-Sayyid Ali Bazina, Muhammad Abdul Qader Muhammad Khalifa, Samir Muhammad al-Sayyid al-Asemi, Ahmed Muhammad Muhammad Mutawaa Zeitoun, and Nasser Sayyid Ahmed Youssef al-Hadari. It notably did not include candidate Moussa Mostafa Moussa at the time it was released on January 26. Other signatories include: Abdel Moneim Abul Fotouh, former presidential candidate and president of the Strong Egypt Party; Essam Heggy, former presidential adviser; Hala Shukrallah, former head of the Dostour Party; Bahey al-Din Hassan, director of the Cairo Institute for Human Rights Studies; author Alaa al-Aswany; University of Cambridge professor Khaled Fahmy; American University in Cairo professor Rabab El Mahdi; and others.